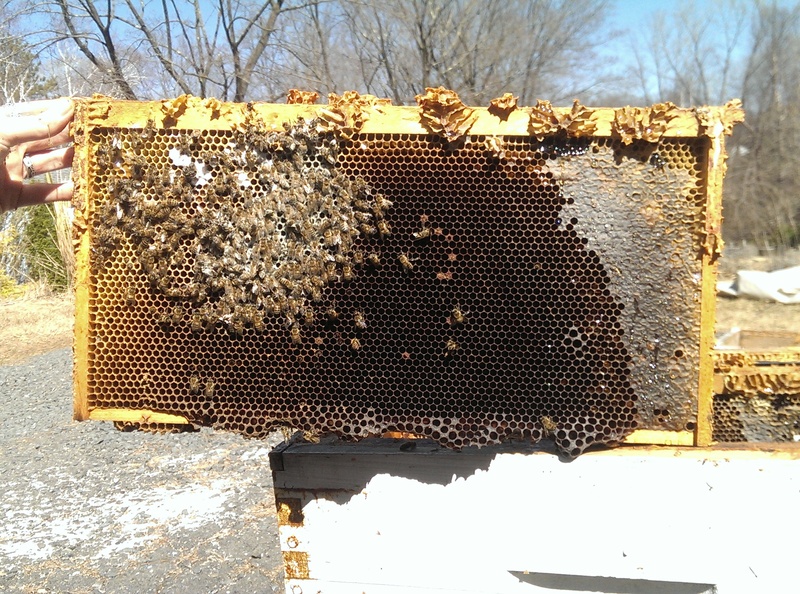 Eastern Shadow Hive was alive and healthy as of January 2015, when during a few of the warm days, I watched a good number of honey bees come out for cleansing flights and bring out the dead that had fallen to the bottom of the Hive. I felt overjoyed to see the bees doing so well in January, though I had no idea of the WAY below average temperatures and amount of snow to come in February. Spring was delayed by about two and a half weeks as well, so I wasn’t able to go into the hives until April 11th. Eastern Shadow was a thriving wild Beeing who chose to live on my porch in an old hive in August of 2013. She swarmed twice in 2014 and went into winter strong and healthy. Here is Her first major pollen run of 2014 https://vimeo.com/home/myvideos/page:1/sort:date/format:video. Notice in the video all of the propolis on the Hive and on the porch boards in front of the Hive. What I noticed about Her, was that She lo ved propolis and dotted it everywhere. 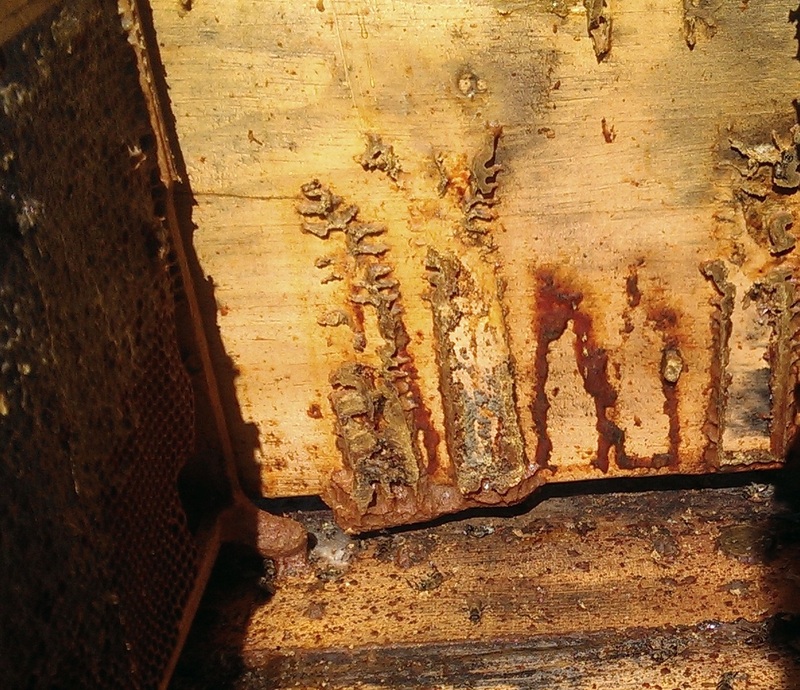 The porch boards were dotted in propolis out to about two feet from the entrance. I watched many bees land about a foot from the Hive and walk up through the propolis “field” before entering. 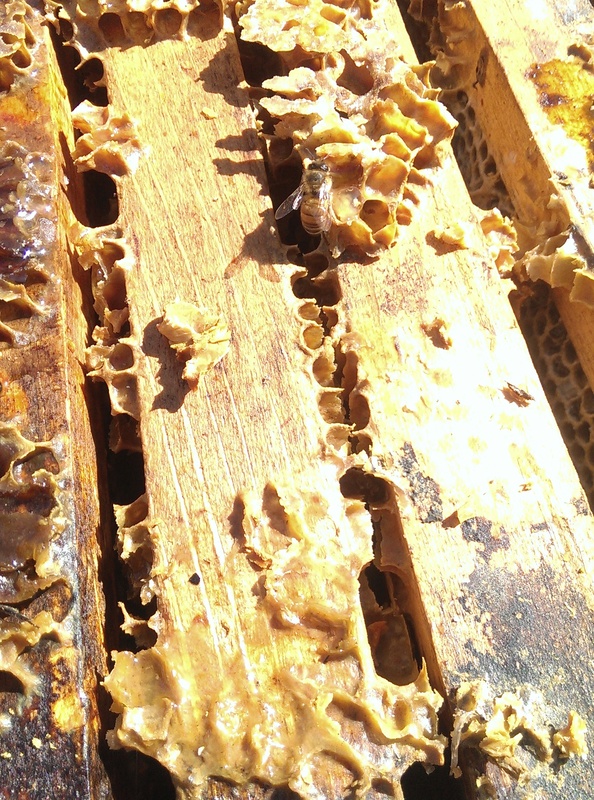 What an effective and beautiful immune system honey bees have! 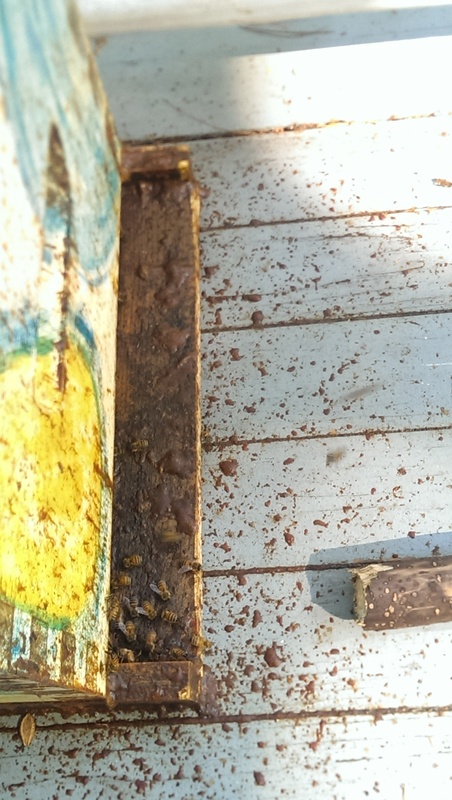 The picture to the left shows the entrance and porch boards covered in propolis. This was made even clearer after the autopsy as I saw the propolis tunnel that not only would control air into the hive, but also provide each returning bee a sort of propolis cleansing each time they entered the Hive and might be “contaminated.” Take a look at the tunnel on the left side of the photo here. I only had my cell phone, so this is as good of a picture as I could get. The picture below is taken from the perspective of looking out the front entrance from the inside of the hive body during the autopsy once all of the frames were out. There were about two frames of bees on both sides in the cluster. Since they probably were dead in February and the weather did not allow me into the Hive until the middle of April, it is no wonder why the bees bodies, which would have given off moisture, had a mold on them. There was no sign of mold or disease anywhere else. It is heartbreaking to lose a Hive, especially a strong Hive that you did not expect to lose. Her gifts of wax and honey will help other Swarms to become stronger. Here is one Sweet Bee taking the gift so that Eastern Shadow can go on for future generations and Her experiences can be passed on. Rest in Peace, Eastern Shadow! May I hear your Song on the breezes and in my Heart and while I Dream. Next PostOM, or is it MO?